Need more information about booking Home 9654080 ? Our beautiful, country style house with its stunning garden of olive trees, will accomodate up to 7 people, offering them summer or winter a relaxing environment in the unique landscape of Cyprus mountainous area. Clean and nicely maintained, it is fully equipped, inside-out. 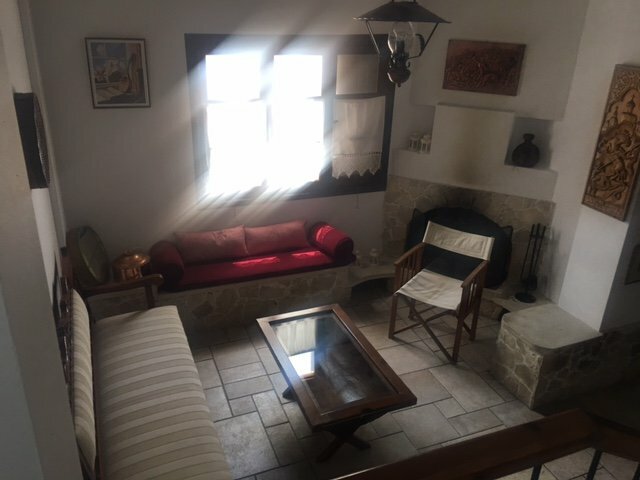 Ideal for families with kids (2 bedrooms with double beds and 1 with 3 singles) or a group of friends who want to bond next to the fireplace or stay at a place ideally located for hiking, exploring Cyprus nature, the ancient monasteries, unique wineries, or even just enjoy village life. Dogs are allowed if they are of small or medium size and they have their own cot. Outside they need to be accompanied and in the house not allowed to be on furniture, sofa, chairs or beds. Dogs are not allowed in the first floor of the house. The use of the fireplace need to be made with caution. Wood is complimentary offered for the first night and then if there is a need for more is offered upon request and with extra charge depending on the volume required.